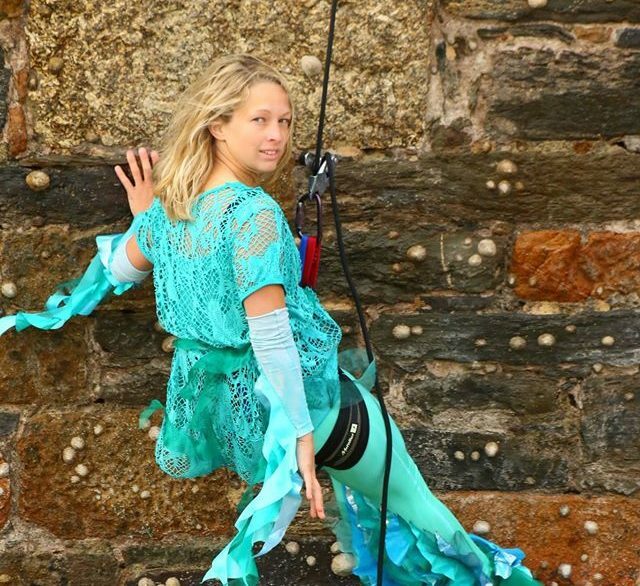 This summer, Yskynna are once again flying high across the walls of Royal William Yard Plymouth, joining the Giant Squid for some underwater adventures! Commissioned by Urban splash to celebrate the start of the summer holidays, Yskynna will be bringing brand new nautical themed performance work to the wall on August 5th . ‘In the Depths’ will mesmerise audiences with ever evolving patterns and pathways emerging over the walls of the secret garden. See the magical mermaid dive and swim around shoals of fish, exploring the deep blue sea the giant squid once called home. With original ideas and choreography by Krowji-based practitioner David Greeves, performed by company dancers Thomas Mason, Charlotte Luke, Rebecca Miles, David Greeves and Georgie Barnett, ‘In the Depths’ is sure to captivate and enthral audiences of all ages.